Seo, H. J., Hwang, W., and Lee, M. C. (2017). "Fire properties of Pinus densiflora utilizing fire-retardant chemicals based on borated and phosphorus (I) – combustion characteristics," BioRes. 12(3), 5417-5427. The combustion and thermal characteristics of fire retardant-treated pine (Pinus densiflora) were evaluated according to the KS F ISO 5660-1 (2003) standard, using a cone calorimeter. The specimens were treated with fire-retardant chemical compounds using pressure-impregnation equipment to reliably impregnate the compounds inside the wood. The heat release rate value of the fire retardant-treated wood specimens showed that the heat release time was delayed. A reduction of the total heat release value can indicate that fire was prevented from igniting in the materials during combustion. The microstructures of natural specimen and treated fire-retardant chemical compounds specimen were determined by scanning electron microscopy. It also confirmed that the pressure-impregnation processing method was effective in comparison to the other treatment methods. Wood is mainly used as interior and exterior materials in residential and non-residential buildings. In Korea, wood is now being actively used again, which is a departure from past trends. In 2013, The Code on the Sustainable Use of Wood was enacted to encourage the use of domestic wood (Seo and Son 2015; Seo et al. 2015). Based on this code, a trend has developed in the wood industries to encourage the use of wooden products, wooden materials for building worldwide, etc. In addition, wood is considered to be an environmentally friendly material, thus its use is continuously increasing (Lowden and Hull 2013; Seo et al. 2015). Over the past few decades, many studies have focused on fire retardant-treated woods (FRTWs) because wood is flammable due to its main components (Angeler et al. 2004; Pabeliña et al. 2012; Islam et al. 2013; Lowden and Hull 2013). To improve the fire retardancy properties of wood, fire retardant chemicals, such as boron, boric acid, phosphorous, phosphates, and nitrogen, have been used to form a char on the surface of treated materials (Altun et al. 2010; Branca and Blasi 2011; Lowden and Hull 2013). Almost all of the existing flame retardants used for wood are effective in reducing various fire parameters such as the heat release rate (HRR), the mass loss rate (MLR), the smoke production rate (SPR), and the flame spread (Altun et al. 2010). Various types of fire-retardant treatments are used for wood. According to previous research, several methods have been used to reduce the flammability of wood and wood-based materials through chemical treatment, including impregnating a flame retardant inside the wood, applying flame retardant paints onto the surface of wood, or coating a flame-retardant film onto the surface of wooden materials (Chen et al. 1999; Grexa et al. 1999; Kawamoto 1999; Grexa and Lubke 2001; Seo et al. 2016a). The first method involves impregnating the inside of the cell walls of wood (the pit) with flame retardants such as phosphorus, boric acid, silica-based and other inorganic chemicals, or nano-sized flame retardants. The second method involves blocking flames by coating the surface of wooden materials with a flame-retardant coating (Chen et al. 1999; Lowden and Hull 2013; Seo et al. 2016a). Phosphorus, antimony, bromide, boron, and nitrogen are chemicals that are frequently used as fire or flame retardants in wood (Liodakis et al. 2013). Phosphorus-based fire retardants are widely used for cellulosic materials due to their effective fire retardant performance. Among the various chemicals di-ammonium phosphate, [(NH4)H2PO4] reported by Branca and Blasi (2011) and Liodakis et al. (2013), can be used as the sole agent. Moreover, potassium carbonate (K2CO3) is a useful chemical agent for improving the fire retardancy of materials, such as oriented strand board (OSB), plywood, etc., according to Ozkaya et al. (2007). The fire-retardant chemical composites, utilized in this study consisted of the following inorganic chemical compounds: ammonium phosphate dibasic, borax (sodium tetraborate), K2CO3, and phosphoric acid (H3PO4). When chemical components are used as flame retardants, the combustion temperature can be decreased and a higher amount of char can be formed on the surface of the materials (George and Susott 1971; White et al. 2013). This present study aims to examine the combustion characteristics of untreated wood and fire-retardant treated woods (FRTWs). It also aims to determine how to improve the fire-retardant performance of FRTWs, according to KS F ISO 5660-1 standard (2003), using a cone calorimeter. The microstructure properties of chemicals in the FRTWs are measured using scanning electron microscopy (Hitachi, Tokyo, Japan). Thus, this study attempts to assess the combustibility of FRTWs for use as exterior and interior materials for buildings. In this experiment, wood from the pine tree (Pinus densiflora S.) was used as the test specimen. The wood was provided from PyeongChang in Gangwon, Korea. Lumber from that species has been widely used as exterior and interior finishes and furniture materials for residential and commercial buildings. This experiment used the sapwood of P. densiflora S. The 100 mm × 100 mm × 10 mm samples were prepared in plate form according to the KS F ISO 5660-1 (2003) standard. The specimens were oven-dried at 60 °C for 48 h.
The chemicals in the fire-retardant composites (FRCs) were prepared by mixing di-ammonium phosphate [(NH4)H2PO4], di-Sodium tetraborate decahydrate (Na2B4O7), K2CO3, and H3PO4 (Dae Yang Environment & Chemical, Anyang, Korea). They are soluble in water; thus they were applied in the form of aqueous solution to be impregnated inside the wood specimens. The composition rate of these chemical species were determined through validation experiments, which were carried out to determine the optimal species composition rate. In the initial experiment, the ratio of di-ammonium phosphate, potassium carbonate, and phosphoric acid was set to 10, 20, and 30 in order to optimize the composition ratio of FRCs. Of these, a ratio of 20 was determined to be optimal in terms of performance, and 30 was an overqualified. Table 1 shows the FRCs proportion and formulas. This experiment employed an impregnation method using a vacuum (0.77 bar, 30 min) and pressure (13 bar, 30 min) to treat the wood specimens. The fire-retardant treatment process consisted of three steps. First, the specimens were treated by vacuum at 0.77 bar for 30 min. Through this process, the spaces in the chamber and the wood pits were in the vacuum state for impregnation inside the pit of the specimens. Second, the wood specimens were treated by pressure at 13 bar, for 30 min. The FRCs were placed into the chamber, and the chemicals were impregnated into the pits inside the wood. Then, the specimens were once again treated by vacuum at 0.77 bar, for 30 min. It is a method based on ASTM D 1413-76 (1976). 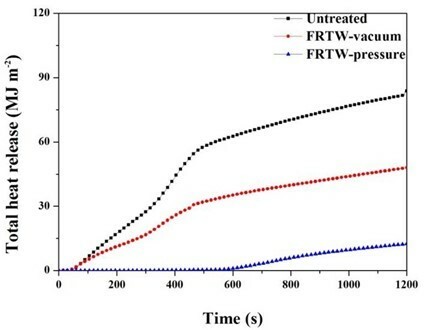 This standard specifies methods for treating wood preservatives, in the case of FRCs developed in this study, fire-retardant chemical species were selected and mixed in order to be applicable directly to the wood preservative plant. In subsequent work, FRCs were processed in accordance with this standard because of the possibility of commercialization through processing of FRCs to wood in factories. At that time, the chamber was empty, but the FRCs on the surface of the wood specimens were infiltrated into the pits. This post-treatment process, involving vacuum, is required to apply FRCs remaining on the surface of the specimen to the inside of the wood voids and to make them fill more tightly inside. During this process, the FRCs were impregnated into the pits of the wood specimens and stabilized due to constant pressure. Figure 1 shows the process for the FRCs treatment. Preparation of FRCs/P. densiflora S.
The microstructures of the FRC-treated specimens were determined by SEM (S-3200-N, Hitachi, Tokyo, Japan) at room temperature. The specimens were observed under the acceleration voltage condition of 20 kV, which was used to collect the SEM images. A cone calorimeter (Fire Testing Technology Ltd., London, UK) test was conducted to determine the flammability of the specimens, according to the KS F ISO 5660-1 (2003) standard. Prior to testing, the specimens were conditioned to equilibrium at 50% relative humidity (RH) and 23 °C. Next, they were wrapped with aluminum foil (using the ‘shiny’ side), and they were placed in a horizontal position under the cone heater with a voltage of 50 kW/m2. The experiment proceeded at room temperature with a RH of 50 °C ± 5 °C. During the test period, the HRR, THR, MLR, SPR, and the effective heat of combustion (EHC) were measured. 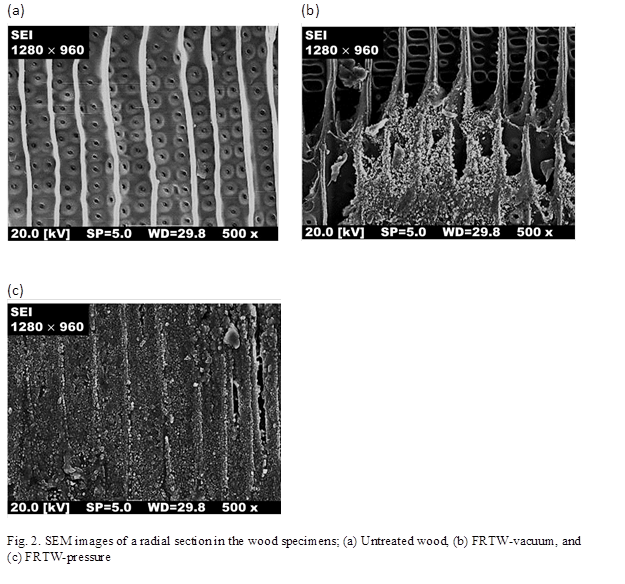 Properties of FRCs/ P. densiflora S.
The SEM images for the untreated wood and the FRTWs specimens are shown in Figs. 2 (a) through (c). In the untreated wood specimen, the radical section showed an open area in the luminal cells and pits, as can be seen in Fig. 2 (a). The FRCs were evenly incorporated into the luminal cells and the pits of the untreated wood. Based on SEM imaging, the FRCs almost fully filled the luminal cells and pits. This confirmed that the characteristic properties of the fire retardancy of FRCs could be expected due to the composites. Altun et al. (2010) reported that metal salt solutions can be used to solidify within the structure of wood by replacing cyanide ions in water-glass and boric acid. Horrocks (2011) noted that phosphorus, nitrogen, and silicon combined with cellulose are solidified by dehydration due to the formation of char. Therefore, the boric acid and cyanide ions in FRCs in the cell pit could have contributed to the formation of crystals in the FRC-treated wood specimens. Several important factors are used to specify the combustion characteristics of materials, including heat release rate (HRR), total heat release (THR), mass loss rate (MLR), smoke production rate (SPR), and effective of heat combustion (EHC). As can be seen in Fig. 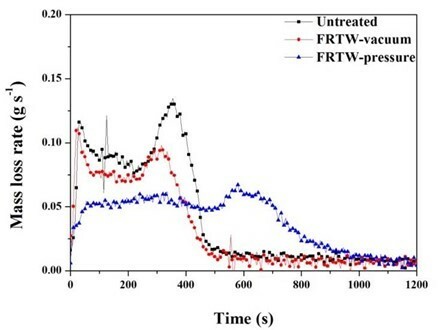 3, the pk-HRR values of the FRTW-vacuum and FRTW-pressure were greatly reduced compared to the HRR values of the untreated wood specimens. 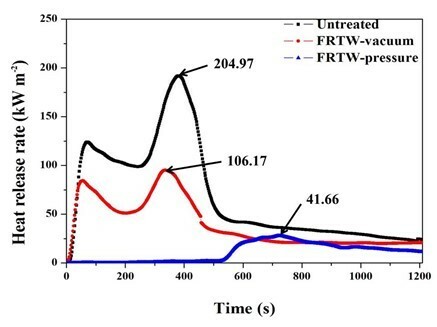 Moreover, comparing the data from the vacuum and pressure methods used to treat the fire retardant-treated specimens, the HRR value of the FRTW-pressure specimen was approximately half of the value of the FRTW-vacuum specimen. According to the KS F ISO 5660-1 (2003) standard, the pk-HRR represents the highest level of the HRR value; it should not exceed 200 kW/m2 and the heat value should not be maintained for longer than 10 s. The HRR is the number of calories released by the surface of the material. Generally, the pk-HRR value is considered to be the parameter that expresses the strength of the HRR value. The HRR value in the discharge of the fire retardant-treated wood specimens did not exceed the limit of the standard. The HRR is the main indicator for the risk of flame spread (Grexa and Lubke 2001; Lee et al. 2011; Dao et al. 2013; Seo et al. 2016b). It is also used to evaluate the flame spread on the surface of materials. The shape of the curve was typical for pine species in Korea (Chung and Jin 2010). The HRR curves showed two peaks: one for the untreated wood and one for the FRTW-vacuum specimens. In comparison, the HRR curve for the FRTW-pressure specimen showed just one peak. As one can see in Fig. 3, the HRR values of the fire retardant-treated specimens showed that the ignition time was delayed, which increased the slope. In the process of burning wood, a char layer formed on the surface. This char layer functioned as a barrier that prevented flame spread into the material. Thus, the process of pyrolysis was reduced. It has been determined that the char is caused by the expansion from thermal decomposition of ammonium phosphate dibasic and ammonium carbonate (Morinaga et al. 2000; Seo et al. 2016a). In this experiment, these chemicals were expanded due to the flame generated by the cone heater, and it produced materials with the ability to prevent diffusion combustion, such as char. The THR curves of all the test specimens are shown in Fig. 4. The total number of calories released during the burning and emitted from the surface of the specimen are shown in those graphs. These data are important for understanding the flame spread when a fire occurs (Grexa and Lubke 2001; Lee et al. 2011; Seo et al. 2016a). The THR values of the FRTW specimens tended to follow a smooth curve after ignition in comparison to the untreated wood. With increases in burning, the THR curves have been reported to have a lower slope (Mouritz et al. 2006). According to Altun et al. (2010), boric acid and cyanide ions can lead to a lower thermal decomposition temperature and a higher char yield. In this experiment, the THR value was low due to the action of the chemicals in the fire retardant. The FRTW-pressure specimen had a THR value that was less than 8 MJ/m2 for 5 min. According to KS F ISO 5660-1 (2003), this result satisfied the grades for fire-retardant materials. Thus, these results confirmed that, in terms of fire safety, the FRC-treated wood specimens were better materials to use for the interiors of buildings than compared to a natural wood specimen. Furthermore, to properly evaluate the fire-retardant performance of the agent, the treatment process of the fire-retardant chemicals should also be considered. The flammability class specification as given in Table 2 is given in KS F ISO 5660-1 (2003). Figure 5 shows the mass loss rate (MLR) curves of the specimens as a function of the test times. The MLR curves of the untreated and FRTW-vacuum specimens showed an initial rapid mass loss, which continued after 300 s. These results were determined from pyrolysis, because their shapes were similar to the HRR graph. However, the MLR in the FRTW-pressure specimen remained similar at the 400 s mark of the test time. After 700 s, the MLR of the FRTW-pressure specimen decreased, and then it showed a gentle curve. This meant that the pyrolysis behavior was due to the release of combustion gases, such as H2O, CO, and CO2, from the specimen. This also explains why the weight of the FRTW-pressure specimen was reduced before the flame combustion proceeds; the volatile gases are emitted as the combustion progresses in the form of a non-flame combustion before the material was ignited. These results were also apparent in the SPR data curves. Many kinds of interior and furniture materials, when burning, release dense smoke that limit visibility and can cause disorientation in fire conditions when people are trying to escape. In addition, smoke production can explain the complete combustion and incomplete combustion of the materials (Lee et al. 2011; Lowden and Hull 2013; Seo and Son 2015). Compared with the graph of HRR, the graph of SPR was confirmed to be similar to that of graph. Based on the results of this study and previous studies, it was determined that smoke was also released similar to the process in which heat was released during the formation and re-pyrolysis of char. The combustion patterns of the materials can be found in the rate of CO and CO2 emissions as well as in the HRR, THR, and MLR. Figure 6 shows the SPR as the burning time. The SPR values of all the specimens were confirmed by the similar curves for each before the 200 s time marks. However, after 250 s the difference in the data for the three specimens became clear. This was due to the secondary smoke products that result from the char formation and decomposition of the specimens. For the untreated and FRTW-vacuum specimens, secondary smoke products were generated within the time range 250 s to 400 s; it is important to note that the untreated material formed two peaks. This meant that in the untreated specimen the char was frequently broken down. The SPR of the FRTW-pressure specimen was measured after 600 s. It was confirmed that smoke was released in the late stage of detachment after the formation of char. Table 3 shows the comprehensive results of the cone calorimeter test. For time to ignition (TTI), there was no noticeable difference between the untreated and FRTW-vacuum specimens. However, the FRTW-pressure specimen was ignited on the surface of the material after a testing time of 688 s. The TTI is the time that it takes the materials to move from thermal radiation to a surface radiant flame. A longer time results in delaying and/or suppressing the flame spread from reaching the surface of the material. 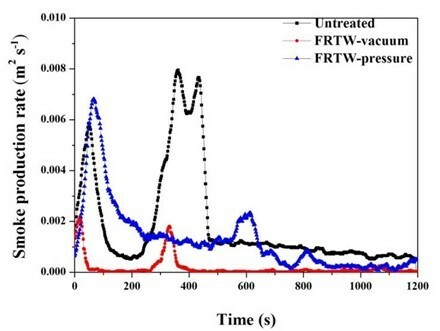 Therefore, similar to the HRR results, the TTI was used to determine if the fire resistance of a material is improved by the char layer formed on the surface of the FRTW-pressure specimen. Table 3 shows the results of cone calorimeter test. Additionally, the EHC value provided useful information about the combustion behavior of the materials. It refers to the thermal energy generated by the combustion reaction, and it is a constant burning time of the specimen with one pyrolytic form. If the EHC values were smaller than the value of the theoretical net heat of combustion, the result of EHC would not necessarily be a constant value for materials that consist of two or more mixtures (Chung and Jin 2010; Xu et al. 2015). The average value of EHC was 27.7 MJ/kg and the maximum value was 251.8 MJ/kg for untreated specimens. For the FRTW-vacuum specimen, the average value was 19.7 MJ/kg and the maximum EHC value was 218.9 MJ/kg. For the FRTW-pressure specimens, the average EHC value was 18.0 MJ/kg and the maximum value was 169.2 MJ/kg. These results indicated that the volatile gas generated by combustion lowered the possibility of combustion and reduced the effect of HRR and MLR. It was also considered that the formation of the char layer on the treated FRCs had a combustion suppressing effect on the surface of the FRTW specimens. The combustion characteristics of the natural wood specimen and the FRC-treated wooden specimens were investigated based on the KS F ISO 5660-1 (2003) standard, using a cone calorimeter. According to the cone calorimeter test results, the application of a pressure-impregnation method for fire retardants was effective for improving fire safety. Additionally, even though the composition ratios of the fire-retardant chemicals were sufficiently good to improve the fire retardancy of the materials, it was confirmed that the fire retardancy performance of the materials could be expressed differently depending on the method used to treat the wood. This work was supported by the National Research Foundation of Korea (NRF), a grant funded by the Korea government (MSIP) (No. NRF-2016R1C1B1006636). This research was supported by Korea Electric Power Corporation through Korea Electrical Engineering & Science Research Institute (Grant No. R15XA03-13). 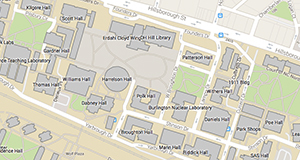 Altun, W., Ozcifci, A., Senel, A., Baysal, E., and Toker, H. (2010). “Effects of silica gel on leaching resistance and thermal properties of impregnated wood,” Wood Research 55(4), 101-112. ASTM-D 1413-76. (1976). “Standard test method of testing wood preservatives by laboratory soil blocks cultures,” Annual Book of ASTM Standard, USA. George, C. W., and Susott, R. A. (1971). Effects of Ammonium Phosphate and Sulfate on the Pyrolysis and Combustion of Cellulose (Vol. 90), USDA Forest Service Intermountain Forest and Range Experiment Station, Ogden, UT. Islam, M. N., Ando, K., Yamauchi, H., Kamikawa, D., Harada, T., and Hattori, N. (2013). “Impregnation of preservative and fire retardants into Japanese cedar lumber by passive impregnation,” BioResources 8(1), 395-404. KS F ISO 5660-1 (2003). “Reaction to fire test-heat release, smoke production and mass loss rate- Part 1 heat release rate (Cone calorimeter method),” Korean Standards Association, Gangnam, Seoul, Korea. Seo, H. J., and Son, D. W. (2015). “Combustion characteristics of wood for interior,” in: Journal of AIOK Spring Conference, Seoul, Korea, pp. 411-412. Article submitted: March 15, 2017; Peer review completed: June 3, 2017; Revisions accepted: June 7, 2017; Published: June 13, 2017.